There were 88,316 fans present at Chicago's Soldier Field on a rainy Friday night for the 19th College All-Star Game on August 15, 1952. What they saw was an error-filled struggle that came down to a fourth quarter rally by the defending pro champions. The Los Angeles Rams, coached by Joe Stydahar, had been an offensive juggernaut in 1951. They boasted the quarterback tandem of Bob Waterfield and Norm Van Brocklin (pictured at right), outstanding receivers in ends Elroy “Crazylegs” Hirsch and Tom Fears, and a good stable of running backs. The All-Stars were coached by Bobby Dodd of Georgia Tech and included future pro standouts in QB Babe Parilli of Kentucky, Washington HB Hugh McElhenny, and offensive end Billy Howton from Rice. The rain began shortly before the game started and continued, on-and-off, through the entire contest. The All-Stars took the lead in the second quarter thanks to a nine-play, 69-yard drive directed by Parilli that included passes to end Bob Carey of Michigan State and McElhenny. Getting down to the LA three yard line, HB Vic Janowicz, a Heisman Trophy winner from Ohio State, powered into the end zone for a touchdown and then kicked the extra point. Fumbles cost the All-Stars significantly as they missed out on opportunities to extend their lead. A 51-yard drive to the LA 26 came up empty when they fumbled the ball away, as did a similar 52-yard series that also reached the Rams’ 26. As a result, while the collegians kept the Rams off the scoreboard for three quarters, they were still only ahead by 7-0 heading into the final period. Norm Van Brocklin had thrown two costly interceptions, but he and the Rams came alive during a drive that commenced in the third quarter and stretched into the fourth. The quarterback known as “The Dutchman” completed two passes, and there was a 30-yard pass interference call that moved the ball deep into scoring territory, on a 76-yard possession that was capped by his three-yard touchdown pass to FB Paul “Tank” Younger. Bob Waterfield successfully added the extra point to tie the game. No sooner did Parilli connect with McElhenny for a 60-yard gain when another fumble by the All-Stars gave the Rams the ball in LA territory. Waterfield’s 24-yard field goal with seven minutes remaining put the Rams ahead, and another Parilli interception assured that the pros would win the sloppy contest, 10-7. The All-Stars outgained LA on the ground (178 to 107) while the Rams had more yards through the air (170 to 104). The collegians also rolled up 33 first downs to just 18 for the Rams. Splitting the quarterbacking as usual, Bob Waterfield completed 5 of 14 passes for 40 yards while Norm Van Brocklin was successful on just 8 of 23 throws for 106 yards and two interceptions as well as a TD. Bobby Dodd used virtually every player on his roster. 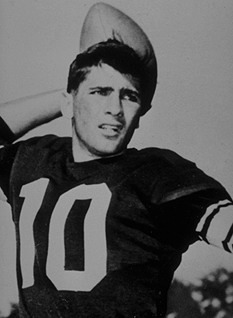 Babe Parilli (pictured below) completed 6 of 11 passes for 88 yards and was named All-Star MVP, but was intercepted twice and fumbled four times. California LB Les Richter, who would go on to play for the Rams, was a standout on defense for the All-Stars. The Rams were widely derided for their poor play against the All-Stars and, following a season-opening loss, Coach Stydahar resigned and was replaced by assistant Hamp Pool. The team finished strong to tie the Detroit Lions for first place in the National Conference with a 9-3 record, although LA lost the resulting playoff game. Babe Parilli went on to a 16-year pro career in the NFL, CFL, and AFL. Hugh McElhenny had his best seasons with the San Francisco 49ers on his way to the Pro Football Hall of Fame while Les Richter, enshrined in 2011, was selected to the Pro Bowl eight straight times as a mainstay of LA’s defense.